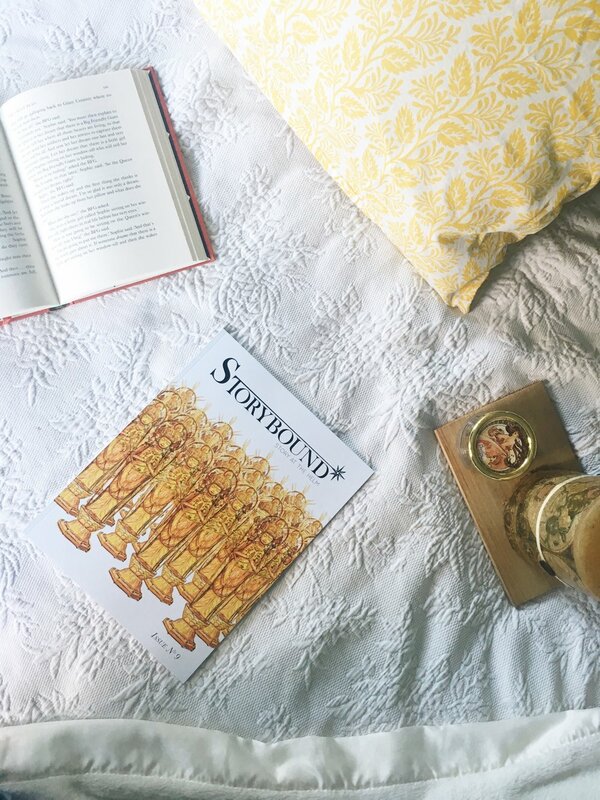 Storybound Magazine is a quarterly publication sharing the stories behind some of the recent projects at Storybound and the inspiring tales we encounter in our travels along the way. Through seeing all these stories unfold together, we offer you a glimpse of just how interconnected every story is, and how far one great story can reach. I love exploring every detail of storytelling—taking apart every piece, the history behind elements, learning what makes a great story, and what makes a great telling, finding the same pieces and patterns in stories across dozens of platforms, discovering new stories and being surprised by new tellings. From travel, to restaurants, museum exhibits, fashion, art, theatre, books, film, television, narrative devices, and much more, we find time and again that great storytelling, no matter the shape it takes, is universal. Explore with us. From the adventure of a lifetime to familiar weekend getaways, from discovering hauntingly realistic tales to exploring the classics again in a new medium, and from the loss of several great storytelling legends to the loss of one of the first major characters in my own childhood story, this was a monumental summer for story exploring. Yet all stories, no matter their size or distance, hold a greater meaning beneath the surface. And every story we found this quarter revealed endless levels to uncover. I hope recounting some of these tales encourages you to explore more in storytelling, under and across the surface, in your everyday world and in new territories, with any and every tool available. The best tellings inspire you to take time with the story. Without realizing it, you’re absorbing the tale, its messages, its moments and you return to them whenever reminded of its world. This quarter, the stories we found invited us to take the time to explore the familiar story-worlds around us—and explore them again. Return to your favorite songs; listen to new recordings, find different emphases, learn the meaning behind every lyric, or listen to the original truly as if you never had before. Revisit your favorite childhood storytellers and see what pieces resonate with you now. Find an old favorite tale in a new and exciting telling. From a favorite teacher to Mr. Rogers, from song lyrics to a classic film, revisiting familiar concepts or visiting lands close to home for the first time, there are always new pieces to uncover. It’s one of my favorite parts of storytelling: the endless capacity for great discovery in the known. This tenth issue found storytellers in many forms taking inspiration from the stories before them. Whether telling the stories of the past as close to tradition as possible, or taking centuries of stories as inspiration for creating a new world, or using your own fiction combined with historical details to inform a design, a connection to the stories of old was always present. Through taking in the stories of our past, and continuing their telling, we connect our tales to a long tradition of searching for understanding. The stories we tell inform our world. We add our answers and perspectives to a stack of deep layers, their meanings and inspirations shining through every bit of our own stories. This issue looks at how both the “good” and the “bad” are necessary in storytelling. Balancing the two forces—good and evil, stasis and conflict, happy and sad—is crucial to moving the story forward. We saw some beauty and invention, and we saw dark history and trials. Across architecture, jewelry, theatre, literature, and history, we see these complexities approached by remarkable storytellers of all kinds. We found that among even the toughest stories there is a pattern: through any trial, through the worst of times, we rebuild, we come back to art, to beauty, to love. And we do through stories. Issue 8 explores how we enter the world of the storyteller in every telling, from finding pieces of stories millions of years old, to finding displays from today honoring the stories of yesterday, to watching pieces come together to tell the stories of tomorrow. We travel to mid-nineteenth century America, early twentieth century Northern California, outer space, the intangible land that songs come from. Each journey, every story, transports us to a unique place and time.